Completed on the eve of the Civil War, the 163' high Barnegat Lighthouse was built among tall cedars on nearly a mile and a half of beach with a 22 room keeper's cottage by its side. The lighthouse was commissioned to operate on January 1, 1859 and was visible for twenty miles out to sea. In the winter of 1919-1920, the beach washed away, cutting into the very base of the lighthouse and destroying the lighthouse keeper's home. Today the lighthouse stands right at the edge of Barnegat Inlet at Barnegat Light State Park, on the northern end of Long Beach Island in NJ. 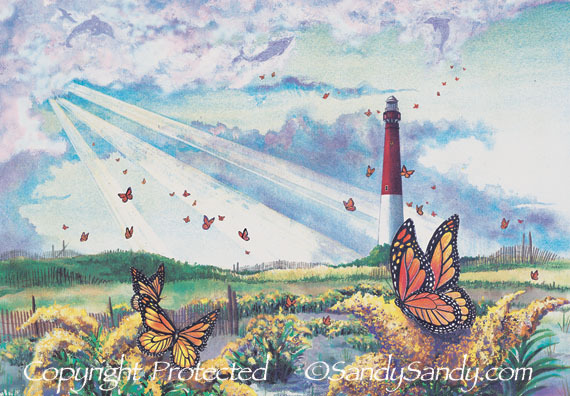 The fall migration of Monarch Butterflies inspired me to create this painting. As they fill the sky and dance on air, they uplift my spirit with them. Butterflies are symbolic of transformation and joy and remind me to lighten up and experience the playfulness and delight of my inner child. Look in the clouds of this watercolor and you'll see imagination and creativity at play.